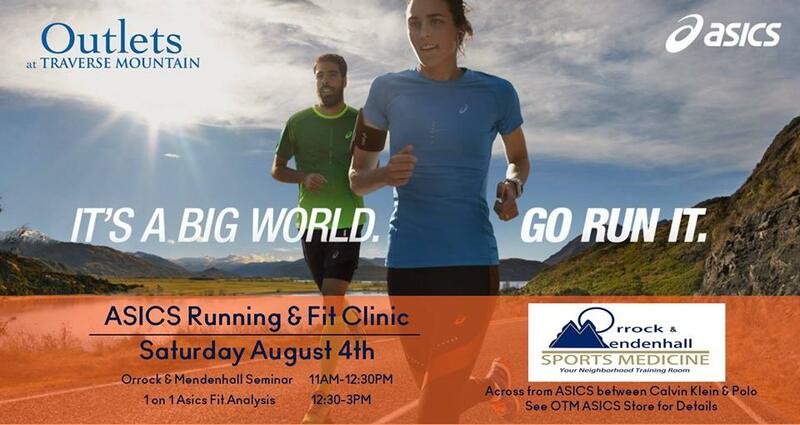 Saturday August 4th from 11AM-12:30PM Orrock & Mendenhall Professional Physical Therapy & Sports Medicine will be conducting a running and fit clinic in partnership with the ASICS store at OTM. The purpose of the clinic is to inform customers of their runner’s anatomy, injuries and how to prevent/recover from injuries. Orrock & Mendenhall Professional Physical Therapy & Sports Medicine will also help runners understand their gait pattern and can help determine if orthopedic and inserts are right for them. After the Clinic From 1-3PM ASICS coaches will be outside the store helping guests determine the best shoe and fit for their particular gait and needs. ASICS wants to help give people a guide to healthy running, in the right shoe for you!